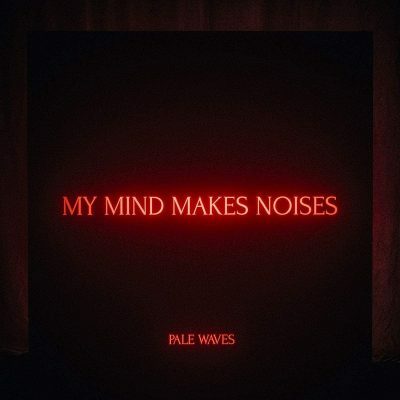 Pale Waves have been generating an increasingly substantial cult following long before the release of their debut album, My Mind Makes Noises, a nod to songwriter/frontwoman Heather Baron-Gracie’s self-analyzing lyrical tendencies in the third track of the collection. The band began with Baron-Gracie and Ciara Doran in Manchester and soon grew to a charming foursome rounded out by Hugo Silvani and Charlie Wood in 2015. After being signed by burgeoning British indie label Dirty Hit in 2017, Pale Waves have trickled onto the airwaves and playlists, dropping numerous singles and an EP before their anticipated freshman album. My Mind Makes Noises opens with “Eighteen,” immediately exposing the Waves’ John Hughes– meets–Elliot Smith feel. Baron-Gracie and her cohorts capture the woes of youth and reminiscence while promising a head bobbing sound that tragically hip, young millennials would likely term “a bop.” “There’s a Honey” was the first single and plays as a solid second track on the album, keeping the ear-worming catchiness going. There’s an enamoring innocence to Pale Waves’ music, yet their narrative is rife with dark, melancholic subtext that puts pop music naiveté on the chopping block. This may be one of the most appealing aspects of Pale Waves: that they are a dreampop band that deals more in tenebrous truth than bubbly romanticism. Baron-Gracie is a Robert Smith analog with lovably awkward accouterments that come through in her supplicating voice and sometimes sappy lyrics—a persona she plays deftly in person. “Noises” manifests this caricature most cogently, although it remains unclear if Baron-Gracie is, in fact, feigning a character at all. “Came In Close” offers some of the tasty, electronic aspects that expose the production influences by which Pale Waves have been shepherded since signing with Dirty Hit. As a solid aficionado of the label, this track is a favorite—mostly for the sonic tricks employed. Several of the tracks on this LP that never made it through the singles filter stand out as the strongest, including anthemic “Drive” and sparkly tune, “When Did I Lose It All.” After the release of multiple songs from the album, a small clamor of quibbles about Pale Waves’ repetitive sound arose. Listeners of the final cut will likely find themselves less distracted by this criticism, as the finished product never betrays their evolving signature sound, yet offers a formation diverse enough to retain interest throughout all 14 tracks. Eighth track “She” is a sudden, sharpened and slow ballad that smacks of the early EPs of fellow label siblings The 1975 … sad lyrics, ambient electronics and searing electric guitar crescendo included. “One More Time” gives the listener a flirty slap across the cheek and evokes classic, ’80s synth pop a la Belinda Carlisle and Pat Benatar. One might be in grave danger of being caught in clunky, jet jubilant dancing and air guitar on their living room sofa while blasting this track and it’s comrade “Television Romance,” with an utterly chant-inducing chorus as the flourish. “Kiss” brings home The Cure comparisons, perhaps something to induce eye rolls from Smith purists, who might (as the title suggest) kiss a certain posterior something if they wish to vehemently dispute the resemblance. “Karl (I Wonder What It’s Like to Die)” concludes My Mind Makes Noises with a somber acoustic guitar and a richness of Baron-Gracie’s pained vulnerability via her viscid Mancunian accent set to minimal sonic disruption. This song closes the collection with an unrest that speaks to the band’s ability to juxtapose the stygian and the sweet.